HTC is set to release a smartphone that'll punch above its weight. Meet the new HTC 500 Desire, a mid-range device boasting a Snapdragon 200 chipset, 1GB RAM, a 1.2GHz quad-core processor, HTC BlinkFeed and Video Highlights. The phone sports a 4.3 inch LCD screen and there's also a microSD slot so users can expand the 4GB of internal memory up to 64GB. Running on Android OS, the HTC Desire 500 has an 8 Mega-Pixel camera on its rear powered by the ImageChip processor and a 1.6. Mega-Pixel on its front. While not as powerful as the camera on its rear, which HTC tells us can be used "to create spectacular stills and HD video", it still can be used for video chat. The Desire 500 also comes front-loaded with HTC's BlinkFeed, which pulls in a selection of news content onto the phone's screen from sources such as AOL, ESPN, MTV, The Financial Times and Reuters. According to CNET, however, Blinkfeed is somewhat hampered by the fact that users can't add their own selection of news sources to it and also can't turn it off. The HTC Desire comes in Laquer Black and Glacier Blue. 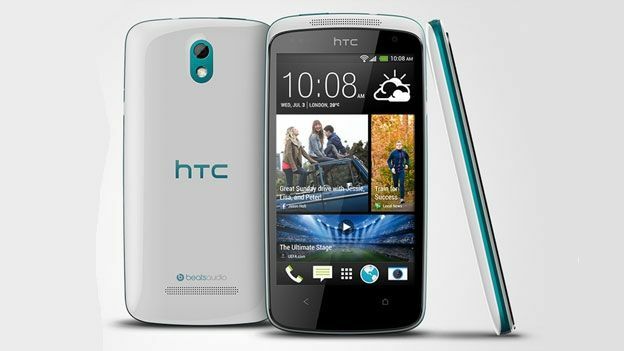 There's no word on a UK release date or local pricing,but HTC assures us that those details are imminent. Watch this space.